Tiffany Haddish was 2017's break out star thanks to her role in 'Girl's Trip'. Now, she's everywhere and taking over Hollywood. 1. Who Is Tiffany Haddish? Tiffany Haddish is an American actress and comedian born December 3, 1979. Tiffany is a native of California and gained her first exposure to stand up comedy at the request of a social worker when she was 17. Tiffany’s father Tsihaye Reda Haddish was Eritrean Jewish. Her parents met after he came to the United States as a refugee. At the 2018 Oscars, Tiffany spoke about his recent passing saying, "my father passed away this year and he’s from Eritrea. He told me 'one day you’re going to end up at the Oscars and when you go, you have to honour your people.'" Tiffany's mother is African American. Tiffany emerged as a break out star in 2017’s 'Girl’s Trip'. Tiffany starred alongside Queen Latifah, Jada Pinkett Smith, and Regina Hall. The film is about a group of friends who travel to New Orleans for a girl’s getaway despite having issues in their own personal and professional lives. In 2018, Tiffany won an NAACP Image Award for Outstanding Supporting Actress in a Motion Picture for her role as Dina in the film. Tiffany Haddish was a presenter at the 2018 Academy Awards alongside Maya Rudolph. During the brief sketch performed by the two comedians, Tiffany jokingly asks “have the Oscars become too black?” This is, of course, in reference to the Oscars so white criticism that has followed the awarding body for years now. Tiffany has spoken at length about her difficult upbringing. When she was a child, her mother was in a car accident that left her with severe brain damage and possibly triggered a mental illness. Soon after, Tiffany and her siblings were removed from the home and placed into group homes and foster care. Tiffany got her official start in comedy when, at the age of 17, a social worker suggested she either enter therapy or join the Laugh Factory Comedy Camp. 8. 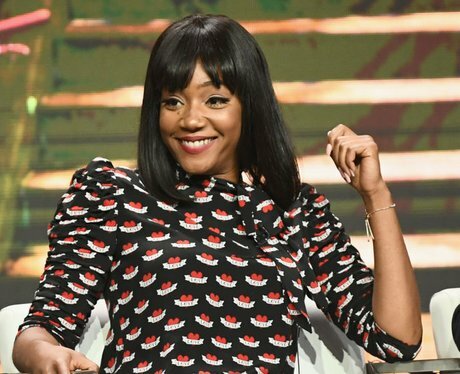 Is Tiffany Haddish married? Tiffany Haddish has been married and divorced twice to a man named William Stewart. She filed for divorce or a final time in 2013. Tiffany has been a brand ambassador for Groupon since 2018. She has appeared in a number of spots for the budget brand, including a commercial that aired during the Superbowl. FANCY. In late 2017, Tiffany released a book called "The Last Black Unicorn". In the book, she details what it was like growing up in foster care, the abuse she suffered, and her career ups and downs. In 2018, it was announced that Tiffany would lend her voice to an upcoming Netflix animated series called "Tuca and Bertie". Tiffany will voice Touca and serve as executive producer on the new show. Fans have high expectations for "Tuca and Bertie" as it will include some of the same production team as the critically acclaimed "Bojack Horseman".